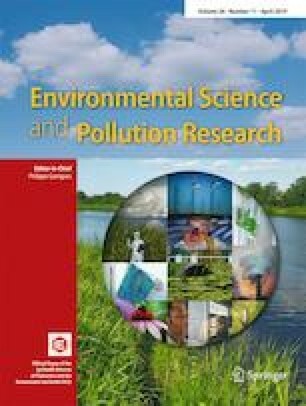 This study aimed to explore the nitrogen and phosphorus removal performance of the horizontal submerged constructed wetland (HSCW) with Ti-bearing blast furnace slag (T). Another two HSCWs, with the converter steelmaking slag (G) and the stone (S) as wetland substrates, respectively, were simultaneously running as control. The results showed that the nitrogen and phosphorus removal capacities of the T-HSCW were generally better than those of another two HSCWs. When the hydraulic retention time (HRT) was 6 days, the effluent concentrations of ammonia nitrogen (NH4+-N) and total nitrogen (TN) were 6.66 mg L−1 and 14.02 mg L−1, respectively, and the removal rates of NH4+-N and TN reached 77.54% and 71.07%, respectively. The T-HSCW had better removal efficiency of phosphorus. The effluent concentration of total phosphorus (TP) was lower than 0.3 mg L−1, and the maximum removal rate could reach 98%. Through the characterization of the three substrates before and after experiments, it was found that the removal of nitrogen and phosphorus by T and G mainly relied on chemical adsorption, while S mainly relied on physical adsorption. Ti could also promote the absorption of nitrogen by plants and increase the nitrogen removal capacity of T-HSCWs. This work is supported by National Water Pollution Control and Treatment Science and Technology Major Project (2017ZX07203-003) and Natural Science Foundation of Jiangsu Province of China (BK20171478).